Winners Andrew Letourneau (Bib no. 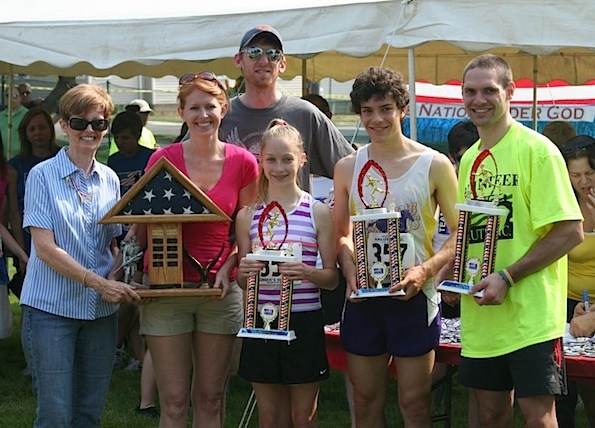 357), top runner overall in the 5K, and Lindsay Graham (Bib no 352), top female runner in the 5K. A large group of runners and walkers turned out for the Salute Inc “Got Freedom” 10K Run, 5K Run, and 5K Walk. Matt Dettloff, male/23, from Palatine IL … 34:57.2 at 5:38 pace. Brian Wakefield, male/36, from Vernon Hills IL … 35:40.0 at 5:45 pace. Ernest Shepard, male/42, from Lake Zurich IL … 36:25.8 at 5:52 pace. Tom Hoffman, male 47, from Arlington Heights IL … 38:02.2 at 6:08 pace. Konrad Mucha, male 39, from Hanover Park IL … 38:22.1 at 6:11 pace. Bradley Lindgren, male 25, from Algonquin IL … 38:38.1 at 6:14 pace. Nick Brey, male 16, Arlington Heights IL … 38:57.2 at 6:17 pace. Peter Martin, male/22, from Mt. 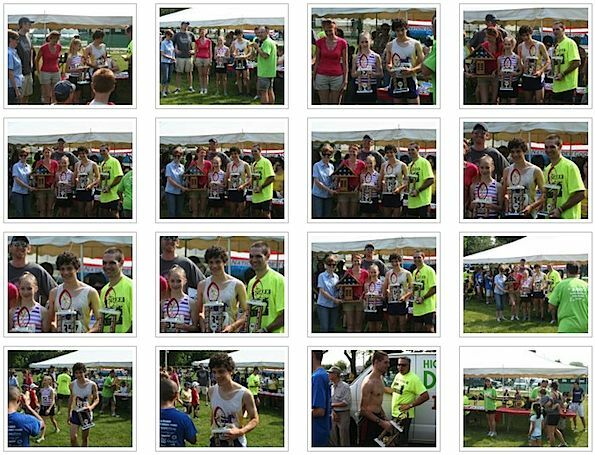 Prospect IL … 39:29.7 at 6:22 pace. Louis Robles, Jr., male/33, from Chicago IL … 39:30.8 at 6:22 pace. Jonathan Cain, male/30,	Des Plaines IL … 39:52.9 at 6:26 pace. Andrew Letourneau, male/17, from Arlington Heights IL … 16:20.5 at 5:16 pace. Steven Salvano, male/15, from Arlington Heights IL … 16:42.1 at 5:23 pace. Jackson Halsmer, male/17, from Byron IL	… 17:16.8 at 5:34 pace. Kevin Kohls, male/45, from Lakewood IL … 17:38.4 at 5:41 pace. Anthony Simone, male/31, from Joliet IL	… 17:51.6 at 5:45 pace. Will Beisedolf, male/18, from Arlington Heights IL … 18:09.9 at 5:51 pace. Ryan Henry, male/16, from Arlington Heights IL … 18:24.7 at 5:56 pale. Matthew Hoffman, male/13, from Arlington Heights IL … 18:39.0 at 6:01 pace. Kevin Ziegenhorn, male/15, from Arlington Heights IL … 18:41.0 at 6:02 pace. Justin Fremstad, male/26, from Viroqua WI … 18:57.1 at 6:07 pace. Bob Olson, male/22, from Buffalo Grove IL … 25:52.5 at 8:21 pace. Lisa Veneziano, female 47, from Fenton MI … 26:01.1 at 8:24 pace. Jay Owens, male/50, from Fenton MI … 27:43.4 at 8:56 pace. Gerald Brown, male/37, from Lombard IL … 28:53.5 at 9:19 pace. Kim Greenstein, female/33, from Arlington Heights IL … 29:51.6 at 9:38 pace. Kathleen Olsen, female/28, from Arlington Heights IL … 30:03.8 at 9:42 pace. Lisa Raucci, female/33, from Arlington Heights IL … 30:55.5 at 9:58 pace. Austin Kennedy, male/22, from Arlington Heights IL … 31:11.5 at 10:04 pace. Robert Nierzwicki, male/31, from Chicago IL … 32:27.8 at 10:28 pace.